LovePrints. The answer to why we do what we do. LovePrints. Leaving things better than we found them. The elevation of another. The forward movement of a potential. The upward possibility enabled by you. The hand, acting in love. The heart, active in why. The constant pursuit of the greater us. The greater you. Year after year, I left parts of my heart and pieces of my body all over the country. Year after year, I was covered in love by the people I was supposed to be there to love. I gave so much and received so much more that I gave. I am a better man than I was because I asked, often demanded, that those around me tried to be better men. Better women. Better parents. Better coaches. Better humans. Each year, my players would write letters. It was one of the tasks I gave them. Write more. Share yourself to the people who love you. Through those tasks, I often opened the door to athletes writing letters to me. Every now and then, they end up being about me. If you ever want an honest mirror, ask young people who know you, about you. Be prepared for gut punches and head smacks. Every now and then a player puts pen to pad and speaks to move your heart. 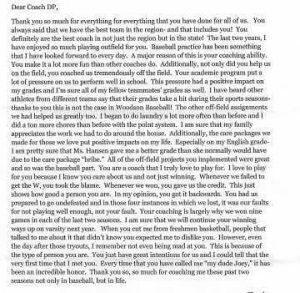 Here is one such letter from a former player and future world leader. I have to make sure that I am worthy of a young person’s words about me. I try to put my Loveprint on them. This one put Loveprints on me. If I only get one athlete to move in love, we win. If both the player and I are moved, we have achieved something special. Newer PostLovePrints. From bat boys to men. Older PostLovePrints. “I “vs. “Us”. “Me” vs. “We”. We are the answer.